Dave Hickson from Everton to Liverpool - LFChistory - Stats galore for Liverpool FC! This article is from a group of articles focusing on the arrival of several big names in Liverpool history who succeeded or failed at Liverpool. Once upon a time they were new signings and unproven in the eyes of the fans and the media and it's interesting to see how they were portrayed in the media at the time. Hickson signs for Liverpool: Leads attack to-morrow. Clubs agree compromise fee of about £12,000. By Leslie Edwards in the Liverpool Echo on 6th of November 1959. Liverpool FC. 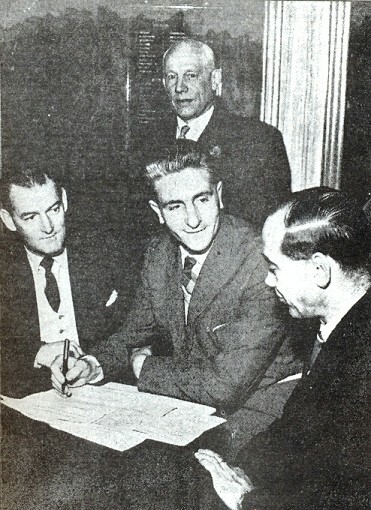 to-day signed Dave Hickson at a fee of about £12,000. He plays to-morrow at centre-forward against his old club Aston Villa, at Anfield. Thus the impasse of a week between the two senior clubs of this city has been broken by compromise. Liverpool stepped up their original offer: Everton toned down the £15,000 fee they set on Hickson's worth when agreeing his transfer request. So I hope everyone is satisfied, though I fear it won't be! The Liverpool party arrived at Goodison Park at 11.45 a.m. and consisted of Mr. Tom Williams, chairman, Mr. Lawson Martindale, director, Manager Phil Taylor and Secretary Jimmy McInnes. After signing Hickson said: "I am very pleased indeed that I have signed for Liverpool after a week of uncertainty and I know my wife and family share my feelings. It has been an anxious time for me recently, but everything is all right now. I am delighted. I am looking forward very much to playing for Liverpool to-morrow, particularly as it will be against one of my old clubs, Aston Villa. I just want the Liverpool fans to know that I will always do my best for them and the club as I have done at Everton." Hickson, the blond, 29-years-old, whose first love was Everton - he joined as a boy of 15 - thus crosses the park to join a club whose need for him was immediate. This was essentially a now-or-never signing, aimed at allowing Liverpool to strike out for a challenging position in their Division, and at promotion. If Hickson is as effective for his new club as he was for Everton when helping them regain status, the £12,000 cheque will have been well spent. Never in the history of football in this city has there been such a rumpus about a player from one club joining neighbours and rivals. Everton fans have written that if Hickson goes they go with him; Liverpool have received warning that if Hickson arrives some of their most loyal fans will depart! It remains to be seen if these factions will be as good as their word. The public and football fans have notoriously short memory. Born in Salford. Lived as a boy in Ellesmere Port. Signed professional forms for Everton in May, 1948 after joining club as a 15-years-old. Had been playing centre-forward of the Lancashire youth team. First team debut against Leeds United, at Leeds, September 1, 1951. In March, 1953, in a Cup semi-final against Bolton, at Maine Road, he was concussed but returned to complete the game, never knowing what the score was. Awarded benefit cheque of £750 in October, 1953. The first of his three suspensions came a month later, for seven days, following an incident against Leicester City at Goodison on October 31. Second suspension, this time for 14 days, in February, 1955. He had been sent off against Sheffield Wednesday at Goodison on December 11. Transferred to Aston Villa in September, 1955, for £20,000. Up to that date he had played in 151 League and Cup games and scored 69 goals for Everton. Transferred by Villa to Huddersfield in November, 1955 for £18,000. Married Miss Irene Jones, of Ellesmere Port, a month later. Re-signed for Everton from Huddersfield on July 27, 1957 for £6,500. Suspended for three weeks in January, 1958. He had been sent off against Manchester City at Maine Road on December 7. Three times dropped from Everton first team this season, the last time a week ago before Leicester City match. Liverpool missed an earlier chance to sign Hickson when he was at Huddersfield and, for all anyone knew, reaching the end of his career. They would not pay the £6,000 fee Huddersfield wanted and Everton stepped in and took at a cheap rate the man they not long ago before passed on to Villa for for £20,000. Hickson's talkativeness on the field has more than once caused his name to go into the referee's black book. Whatever Hickson did on the field he never went out from the dressing room other than determined to play the game and nothing but the game, but his enthusiasm for the cause and idolising effect of his many fans often made for trouble. In recent times he has mellowed a great deal. Liverpool have solved the problem where to inject the newcomer by taking the unusual course of playing Harrower at outside-right to the exclusion of Morrissey. Thus, it has has not been found necessary to disturb the young Roger Hunt, whom most people anticipated might have to lose his place so that Hickson could be accommodated in the centre. Perhaps the oddest thing about Hickson's transfer is the fact that he played his last senior game for Everton at the ground where he will appear for the first time in Liverpool colours to-morrow - at Anfield! So he ends one club career and starts another on the same pitch. He was in the Everton side which won a Floodlit Cup game at Anfield a week last Wednesday.